(1 reply) Hi, has anyone experienced the following behaviour? Uninstalling device app registered to gcm without performing a previous unregister. Then reinstalling the same app on the same device and performing a register operation. You should get the same registration id, however sometimes a new registration id is produced causing duplicated... I'm setting up the server side of a Google Cloud Messaging mechanism, using MySQL to store the registration ids provided by the mobile app. Giving that Google can issue up to 4k registration ids, I'm forced to store them in a TEXT field. Google Cloud Messaging (GCM) for Android is a service that allows you to send data from your server to your users' Android-powered device and also to receive messages from � how to get water out of ears after scuba diving Flyingbag Yes, so your app should be able to handle the registration even in case google refreshes the ID. This way your app can then store the new id on your application server -- You received this message because you are subscribed to the Google Groups "android-gcm" group. I had the same issues. After some research in the net I found that the app tries to work on the old Instance ID which is not be registered properly in GCM anymore. 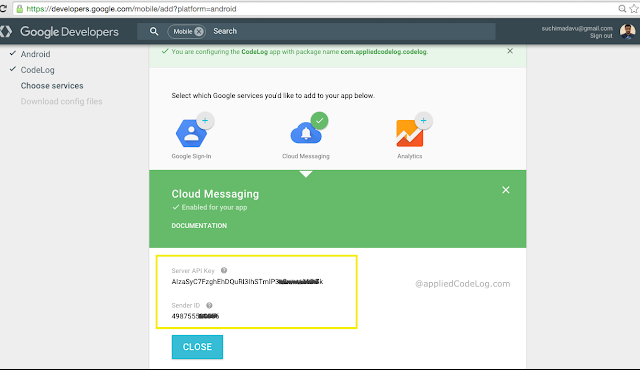 Google Cloud Messaging for Android (GCM) is a push-notification-like service freely provided by Google. Simply, it allows you to send data from one-end �we will call it a GCM server� to GCM clients e.g. Android app.